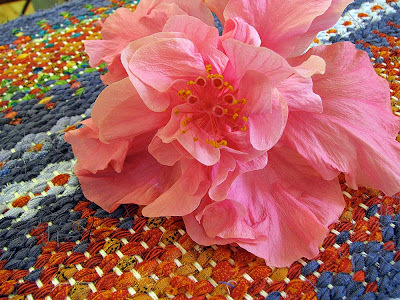 What a treat to see this rug coming off the loom. It is truly a beauty. This is where having a good fabric stash comes in handy; since this was done in fairly fine rags instead of the more traditional wool. It is a swedish weave using three shafts (in this case), called Krokbragd…hopefully spelled right ,and everytime I try to pronounce it, it pretty much sounds like I’m trying to hork up a hairball. Thankfully it looks better than it sounds. The last picture shows the back of the rug laying on top of the front. We liked the back almost as much as the front, although they are very different. I couldn’t wait to get these pictures up; it is just so wonderful to see a project go from thought to reality and to have it turn out so splendidly. It seems to me every project is a little different when off the loom. Although you have been staring at it very intensely and sometimes for quite awhile; so far I am always surprised how it looks off the loom. It has a aspect of a baby leaving the nest and all of the mixed feelings that can represent. Pride, astonishment at its conclusion, and excitement for the next project to be. 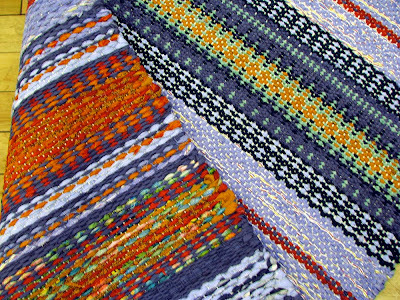 Perhaps I need to finish a few more weavings so I am not so astonished at the conclusion of each one. But wouldn’t it be great if that sense of astonishment is there for each project we create? I will have to ask Susan if she feels that way too. I think you]’re pronouncing it right if it sounds like you’re trying to hork up a hairball. Can you say that on the internet? Ha, ha. Carole, it’s lovely! Absolutely lovely. Krokbragd makes me think of gingerbread houses, sunny rooms on a cold winter day, and warm welcomes. 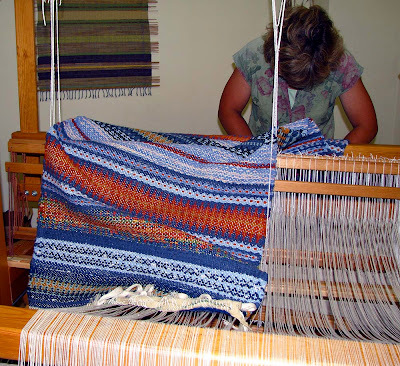 Don’t you love that feeling of wonder as a piece comes off the loom? I do, and I hope I never lose it. Now that you mention it this does make me feel gingerbready. oh that is beautiful! I am off to look up that technique.